MariNaomi is responsible for my favorite book of 2014. She is also responsible for what will likely be my favorite book of 2015. 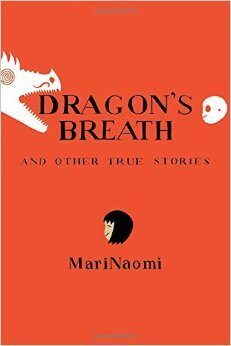 The former, Dragon’s Breath and Other True Stories, is a collection of autobiographical graphic vignettes, documenting events in the life of MariNaomi, from learning there was another, darker side to her loving grandfather, to awkward hang-outs with your teen idols. Candid but not self-deprecating, personal but relatable, Dragon’s Breath casts a wide net capable of reeling in a highly diverse readership. It’s the type of book that reminds you that there are stories in everything and everyone around you. You don’t have to meet Duran Duran to have something worth putting on paper (though Mari did meet Duran Duran and the photo at the end of that story will crack you up). The other tenants in her building, the homeless man on her dog-walking route, her high school biology teacher – these are some of the people she noticed and cared to chronicle in her comic memoirs. They’re people we all have in our lives and that not only makes these stories easy to relate to, it makes them particularly enjoyable. This is also a great book for aspiring writers and artists. Most of the stories were previously published individually on The Rumpus and reflect different artistic styles over time. When Mari read from Dragon’s Breath at City Lights in San Francisco, someone in the audience asked what she felt had changed between this book and her last (Kiss and Tell: A Romantic Resume Ages 0 to 22), to which Mari responded, “I’m so much better now.” That’s not to say that Kiss and Tell wasn’t just as funny and honest as anything in Dragon’s Breath, but Mari also spoke about how The Rumpus had been more interested in stories that didn’t revolve around romance and, given that many of her stories were about her colorful love life, this was a challenge for her to rise to. But while you’re reading through all of those amazing artists MariNaomi has curated for us, don’t forget to pick up Dragon’s Breath. You’ll laugh, you’ll probably make a few comical, wide-eyed faces, and you’ll forever be checking your home for bedbugs.